" ... I immediately pulled $2k out of a never-touched savings account (because bank interest is a joke anyway) and had the most satisfying Lego spree I had ever experienced. I felt so powerful and successful with every package that arrived. It was incredible. I wish I could have stayed up there forever… "
Admitting you have a problem is the first step. Usually I say this as a joke, but all jokes aside addiction can take any form. I have my own set of monkeys on my back, and gf has had hoarding issues in the past. Needless to say we watch our Lego spending very closely. All sets (not on display) for our personal collection must fit with in the storage containers. Any money spent on investments comes from previous sales. Started with selling some childhood minifigs, then bought SW polys worked up to minifig lots, then sealed sets. Funny how you chose "Poly" for your user name. TLG uses these as "the first time is free" to get you hooked. If you find yourself in the LEGO store begging for "just a taste" you need a program. That's partly why I haven't missed a monthly mini build in over three years. Even when I'm out of cash, I can still score a handful NEW bricks on first Tuesday of every month. Yeah....you know when I was young...like preteen....I always wanted the big lego sets and my parents just couldn't afford the darn things back then. Now that I'm older it's almost as if I'm overcompensating for those days. Back then I might have had about twenty small to medium sets. Now I have sixty...most of them large. There's really not enough room to display them all but I make do. And then this year with the release of new UCS sets it could go up to 61 or 62. How about concentrate on only hunting for deals 50% off or more and then sell them on craigslist to fuel this expensive hobby? Yes, I could see myself go the same way, but circumstances were a little different here. But in the end it sounds as if you already did the most important step: you can look at yourself and see and judge what you do. Maybe at some point you can get those initial savings back into the bank and still have all the Lego - the current investment and your own. That's what I've set as my goal, anyway. I"m not sure I understand the ultimate end goal with this article. Are you wanting to get out of investing/collecting but cant because you feel you are addicted like a heroin addict? I definitely get getting caught up in purchasing too many themes, and then getting caught up in having more than is rational. I'm just a small time investor/collector, but when I look at it all, i'm sitting on over a few hundred mint sets, then have a lot of opened sets spread out over many themes. I fluctuate with this quite a bit. I started with the Architecture line, and it's steamrolled out from there. Last year, I let my son open two themes that I sort of think I should have let as strictly investments and that is JW and Scooby Doo. They now look like fads because he barely plays with them. He does play with LOTR and Star Wars a lot and he likes mixels. So, i've decided this year to only stick with SW, and i'll let him get one complete set of mixels in a theme, but quit with the "gotta have them all" concept. I'm pretty much bowing out of minifigure line too this year Even though my son occasionally wants things like Minecrap, a city set, and wants to get a lot of minifigures, and especially those poorly designed ones from kinetix like mario, sponge bob etc I don't give in anymore to this, because there's just too much out there that it's not feasible to "have them all" unless you want to buy a warehouse for a lego room. There are way too many themes to get caught up into. Sometimes you may need to pull back and rethink about all that you have and there is a point where it goes from collecting to just hoarding for the sake of. Maybe you should just refocus on going back to just getting your modular fix, and staying with that. And selling off the other stuff. Cut your losses even if you spent a little extra on a town hall. Because, now you spent way more than that acquiring more sets that you probably aren't 100% interested in. Instead of 200, you spent 2000.... We all do it! But, if it's starting to cause you financial hardship then this stuff is not worth going deep into a hole over. So, start to sell a lot of it off, recoup your costs (it's lego, unless you were buying the wrong sets, you should be able to do that).. and just refocus on a single theme. Modulars are cool in that there's only one a year. You can get by spending about 150 to 200 a year on lego that way, and that's not really that much when you think about it. I know many that blow that much in alcohol in a week. I think scaling down is a decent move if you are just looking to refocus, but keep engaged with the hobby. And really that's all you should look at lego as - a HOBBY! Not a drug. But just as a way to relax and have some fun. One of the reasons I was attracted to the architecture line was it was a small hobby (at first). It was basically 3 sets a year, so it wasn't anything more than an occasional buy. That was until my son started liking legos, then things went a little crazy, because I started buying him a lot of stuff, and then got into the investment side of things too, and then spiraled out into star wars, LOTR, modulars, UCS and other themes. . I do have an exit plan though.... and I think everyone should. I find the hunting part the most addictive of all (that, and watching my listings on ebay like a hawk ). Every box without a shelf tag becomes a prime suspect ..... And every day you wonder "did they perhaps start discounting?". Have to force myself to shut it out of my mind. Luckily I set out to do parting out, which means I have a simple calculation to perform on every set I see - no matter how much it has been discounted. And I try to steer clear of heavy-on-the-minifig sets ... still haven't cracked my way into that business, my one attempt with the minifigs from Riddler's Chase has so far netted nothing (but I still haven't given up hope). Minifigures are where I start when parting out. Will the minifigs equal or surpass the cost of the set? Will the rest of the set be saleable for a worthwhile amount. Yeah, LEGO can become rather draining on the funds and time devoted. Still for a product most had long considered as little more than 'a simple toy' has made great strides showing otherwise. It is the one 'addiction' I am grateful to have. Haha. Who needs another $60 video game for another 'soon-to-be-outdated-and-replaced' couple hundred dollar console when I could buy enough for an epic LEGO cityscape. Lego is like a drug, and we are all pushers or addicts. While some of us happen to be both a peddler and the addict. I may not be good with predictions but I do know those Tumblers will be anything but junk. If you're worried about exceeding your monthly budget, you can do what I do. Donate plasma. As much as you can. Easily pays for a couple exclusives a month. And your saving lives. Poly and others, sometimes hard changes are needed when addiction is present whether acknowledged or not. Limit yourself from buying. e.g. Sell 2 sets in order to buy 1. Take a slight loss if needed. Bottom line is to limit the sets and more importantly cash devoted toward Lego. Get your collection and yourself in total control. i know this is harder said than done. Another suggestion of many is to forget about buying 2+ of each set. Be content with 1 set to build and then resell later if you get board of it or need the cash. From an investment perspective it's really quite simple. You just have to decide how much of your total investment portfolio you are going to put in Lego. Say you have a spare 20,000$ laying around, you could decide to put 5,000$ in a savings account, 5,000$ in bonds, 5,000$ in stocks and lastly 5,000$ in Lego. In this case you'd only have 25% of your total investment in Lego. Say you make some profit or somehow get a hold of another 10,000$, you could keep the ratios and invest another 2,500$ in Lego. Figure out the ratios based on risk and potential gains. You can make your ratios slightly variable, for example 20-30% in Lego. That way you can use some of your savings account to buy that special set. But only go over the nominal 25% when some extraordinary deal comes up. Keep your savings seperated and if you can, make a seperate savings account for this purpose. And never go over your total 100% obviously. Many different ways to try to keep control. I try to keep within my existing cash pile from sales these days when I buy, so this focusses my attention into getting the best deals. The only time I stray beyond this is when I know I have stock I can sell immediately at an acceptable profit, to repay the "must have" deal. Although I do have ~£3k of sealed Architecture investment sets currently in my hallway to tidy to storage before my wife kills me! How did you get 25% off a Death Star in the receipt you're showing.in the title photo? It looks different than say, VIP points usage. Also, Welcome to the nuthouse. Nice observation. Damaged box got me 25% off. That was back in 2011. I loved legos as a kid, had somewhat forgotten about them into about 2 years ago when I strolled the lego store. Now I have a ton, so I know your pain. The $100 you got on the Death Star is pretty epic. In my experience they only offered 10% off, and eventually moved to a VIP points situation. Nowadays, you'd only get $50 in VIP points for the DS. I remember May the 4th 2013 the XWing 10240 came out. Everyone was in line buying the $100 B-Wing UCS, and nobody noticed there were two Xwing's behind the counter with a big red 10% off sticker for damaged box. I scooped one to buy (and of course 2 Bwings) and was out of there super happy. It must have been shortly after that they stopped offering true discounts on any UCS, and instead went to the VIP points bonus system. In reality, $25 in VIP points is better than the 10% or $19.99 i saved on the Xwing that day, but i felt like I had gotten the best deal ever that morning. Still have that XWing on display as it was the first UCS i ever built. Well that's some rambling. Great article! Definitely a cautionary tale. Thank you for sharing. I can certainly relate. Lots of stress in my life, and I will either eat or buy LEGO. I've got a growing stack in the garage of things to build; never seem to have time to put them together. But I constantly want to buy. Usually, when I feel that way, a polybag or a Mixel will satisfy that urge, though. 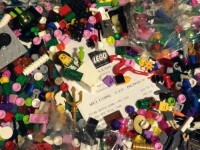 Nice article and I think some people who read this can relate to your struggle, especially when you have interest in Lego as a collector and investor. Collecting is expensive enough. Add investing into the mix and the expenses add up quickly unless you can turn the investments into sales along the way.